Navratri festival is celebrated twice in a year with great devotion and fervor in all over India. First time it is celebrated as Chaitra Navratri or Vasant Navratri in the month of March-April and second time as Sharad Navratri in the months of September-October. According to Hindu calendar, Chaitra Navratri is celebrated in the month of Chaitra or Vasant, which is also the starting of the spring season. Second time it is celebrated in the Ashwin month with the name Sharad Navratri also known as Maha navratri. It is that auspicious time of the year when many pray, observe fast and worship Goddess Durga. Durga Goddess has 108 names and 9 incarnations of Durga are worshiped in these 9 days (Navratri). Navratri, one of the biggest Hindu festivals is celebrated twice a year across india and abroad. Devotees worship the different avatars of Goddess Durga for nine days. All the 9 incarnations of Durga signifies distinct power. ‘Navratri’ refers to the nine pious nights during which Goddess Durga is worshiped and lot people observe fasts. During Navratris generally people give up non-vegetarian food while many others try reducing intake of onion and garlic from their meals. Autumn Navratri also coorelated to Dandia festival. Navratri festivities gives one a chance to get back to the roots and cleanse oneself, be it thoughts, or body . It is great way to detox and many observe fast by eating selective fasting food, or vrat food. Get ready for the joy of the festival with some of my fasting recipes. These recipes are made from ingredients suitable to be consumed whilst on fast e.g. Sabudana / Sago, Water chestnut, Carrot, Paneer, Milk, etc. Sabudana Kheer : A perfect dessert, why navtari food has to be boring? 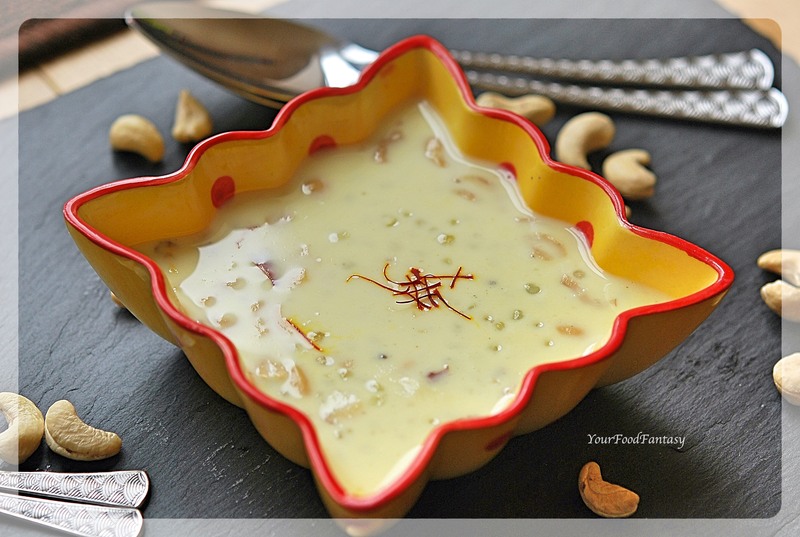 Makhane Ke Kheer or Lotus / Foxnut seed Pudding : Quick dessert recipe of super healthy makhana. Add dry fruits and make “dry fruit kheer”. Roasted Makhana : Fasting or not fasting! Roasted makhana are any day hit as snack. Super easy to make and great source of energy when fasting. Aalo Ka Halwa : Surely you won’t be able to say no to the great taste of this potato based dessert. Lauki Ki Kheer / Bottle Gourd Pudding : Enjoy your fast with a lip smacking dessert made of simple ingredients (Bottle Groud and Milk). Makhane / Lotus seeds Cutlet: Innovative recipe using healthy Makhane / Foxnut / Lotus seeds. Aloo Ke Falahari Sabzi | Potato Curry with out garlic and onion : Traditional recipe to make “aloo ke vrat wali sabzi” with minimal ingredients. Unbelievably quick and easy to make, with taste that will put best of spices to shame. Kuttu Ka Dosa / Buckwheat flour Pancake: Eat this yummy pancake / crepe / dosa in your meal packed with energy and taste. Rajgira Paneer Patty : Enjoy festivities with this great starter / snack made from Paneer. Kuttu Ke Poori : Perfect combination for gravy based potato curry. Sabudana Khichdi : The good old Sabudana / Sago Khichdi, will pack you with enerfy and taste. Singhara Burfi : Water Chestnut / Singhara can be used to make this soft, sweet and tasty dessert.